1607/1703 were butter smooth and 1709/1803 were smoother than 1809/19H1. I also confirm audio problems even with my AE5 not just an extremely old XFI or just old SBZ. But I can't do anything. I just wait 1903 with false hopes. What kinds of issues are you having with the AE-5? No, you're just experiencing WinSxS's effect on the Size: value. 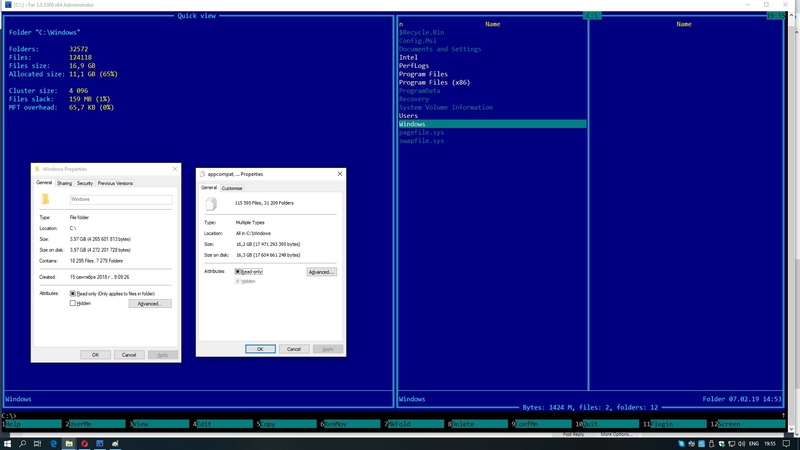 When both WinSxS and the system folders are selected you get single files contributing twice to the size property. Nope. I've seen that behaviour even in the Pictures folder ... no winsxs there. It can be a bug in the shell itself. 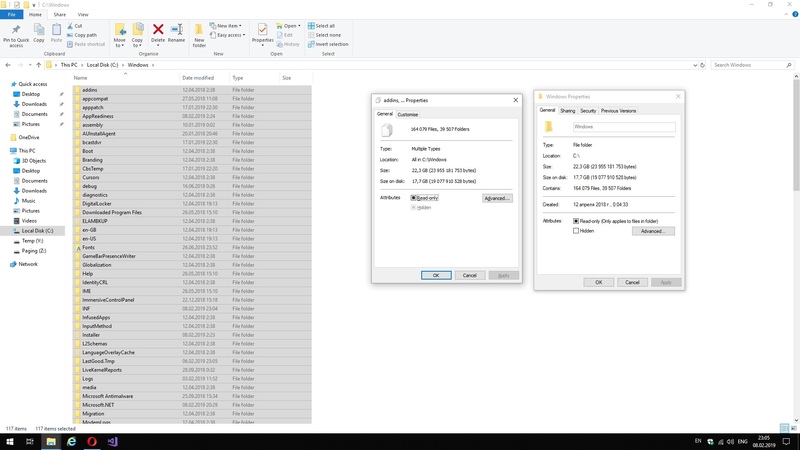 See the number of files and folders in both dialogs. We can assume that when you invoke properties dialog on one folder "Windows" shell invokes it correctly, and when you select files and folders inside the folder "Windows" shell fails in calculating selected items and their sub-items. PS And if this assumption is correct no backups will be affected - backup software doesn`t work through the shell. 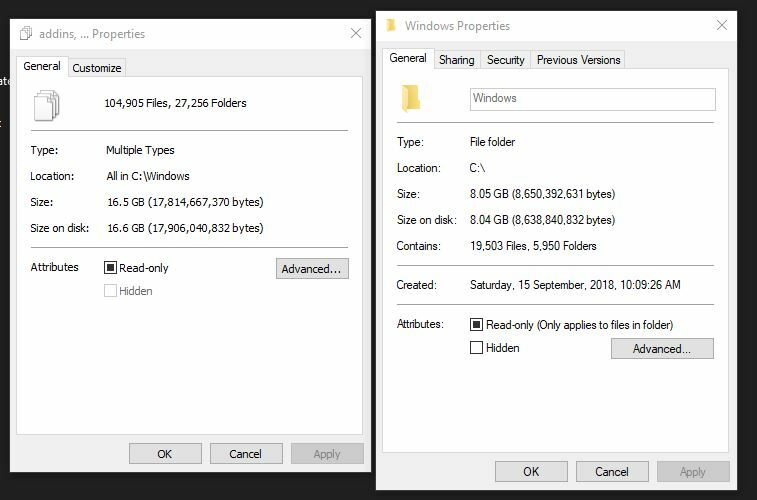 - I have checked in the Far file manager and it calculated even bigger numbers of folders, files and bytes for "Windows" folder. I have tried that on my home rig with Win10 1803 and there is no difference in these two properties dialogs. But we can see that numbers are closer to your properties dialog invoked on selected folders and files in "Windows" folder. Update: After I performed a clean-up of disk C: (at home rig) folder "Windows" lost some 8000 files. Strix DLX sound card finally died after reboot with this, USB via PCI-E so it's been clicking a bit over the last month indicating problems initializing but still managing to come through until today. Oh well it's been over three years and hardware can fail and there's been some indication what with the clicking over the last couple of weeks. Back to onboard for now and yet another reminder that this entire system needs a replacement. Anyways that's why it took more than the usual half hour or so from install and cleanup to posting about it. EDIT: Amazing personal experiences with Asus woefully under supported and curiously designed sound card aside though this is a pretty short list of fixes but focus is likely on finalizing 19H1 for it's mid-April release now was it? Thought it was March but i guess April is better for fixing up the kinda lengthy list of issues that have been following the last few builds now so hopefully that gives Microsoft time to sort that all out. I am still on RS4 1803 due to the blank AC notifications. Has this been fixed yet? If not i might as well wait for next Windows release..
With two months to go until 19H1 I'd just wait, it probably has other fixes from RS5 here too which haven't been addressed in these cumulative updates and it's close enough that assuming the launch isn't a complete bust I would just move to that build instead and skip RS5 entirely at this point. As for the action center notifications I think it's improved at least and covered in some earlier cumulative update release notes but reports still seem a bit divided so it's probably not entirely gone either from what I've been reading at least. I'm getting annoyed with the truncated FLAC id3 tag bug in Windows v1809 that means cropped song and album titles in Groove, which is apparently fixed in the next build of Windows. And, yes, I like Groove! Besides the obvious question of how on earth Microsoft managed to break this functionality in the first place since it was working fine before, the more obvious question is why does it take them so long to migrate fixes into current builds if it is already fixed in the next version of Windows? The Feedback tool is utterly useless since there are dozens of reports of this issue but Microsoft have yet to fix it. It has been an issue since last September (it was fine in Windows v1803 though). And, yes, I like Groove! alanm and RzrTrek like this. Tried 18334 and my explorer bug is fixed there. I hope it's patched in 1809 as well as I cba with current branch and upgrades. I rarely use system restore but had to today. It wasnt even a big restore, and was very recent. Got stuck for about an hour in the restore process so interrupted it and restored a system image. Researched this and found many people experienced the same. How embarrassing for MS. 3rd party software gets it right and is much more reliable than MS own junk. I would not compare 3rd party tools which do full volume image restore with system restore. Can your 3rd party tools restore a selection of system files on the working OS? It is a practical comparison. An unreliable system restore which hangs for an hour to restore just a few system files or a full system image which restores everything in 5 min? Full system image is much more easier. System partition, not whole drive. 24gb OS restore to SSD is actually less than 5 min with Aomei Backupper. You obviously dont have much experience with system partition backups/restore on SSDs or are using pitifully slow imaging software.. Or huge OS for your system. All imaging software works with the same speed because the limit is the speed of disks. I worked for 10 years in Paragon Software Group namely in disk utilities division and I know the differences between apps from different companies - features like formats of image, like the type of target storages (cloud, virtual machines, raw partitions), like the presence of boot media builders, like compression. Of course in some apps you can configure a huge level of compression and this can affect the speed. I have 600GB occupied on my system disk (SSD). I have tried 3 utilities - Paragon (with my own pieces of code), Eseus, and Windows own backup - all 3 made the image for 100 - 120 minutes. The same speed as you have with your 24GB. Why is your system disk so big? Unless the entire stuff needs to backed up every time, it doesnt sound very practical. I only image my OS, and as you well know, you dont need more than 25-30gb for a functioning OS. Any software added/installed does not have to go on the OS, but on a separate partition/drive. This way I operate lean and mean. If anything goes bonkers, a restore has me up and running in 5 min. Most of these GBs are games. And games gain being installed on SSD. I switched from HDD to SSD not that long ago so the system partition was already big, and I was too lazy to split OS and games. So I went to buy two SSDs of the same size - a good one and a cheapest one (for backups). Also I had restored system partition from image file only one time. So the importance of lean OS partition was quite low in my eyes. PS When I have a sudden spare money I tend to do impractical things. Which was the case with SSDs.